Achieve clear skin with the NeoClear Laser Acne Treatment System, the latest technology in acne treatment! Virtually pain-free, no downtime, highly effective. Your journey to clearer skin is finally at an end. Nobody asks for acne, and treating your acne on your own can be difficult or even impossible. You’ve tried every over-the-counter acne treatment method available but still haven’t achieved the results you’re looking for. Your wait is over. We are one of only two skincare clinics in Portland, OR that treat acne with the latest leading technology—the Lightpod Neo. 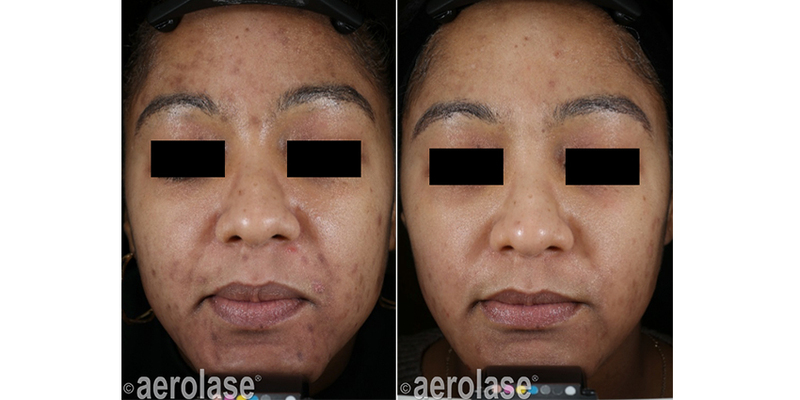 RediMedi Laser Skin Clinics uses Aerolase Lightpod Neo technology to treat the visual effects, damage, and source of acne. Best of all? The treatment process is virtually painless and effective on every skin type with almost no downtime at all. 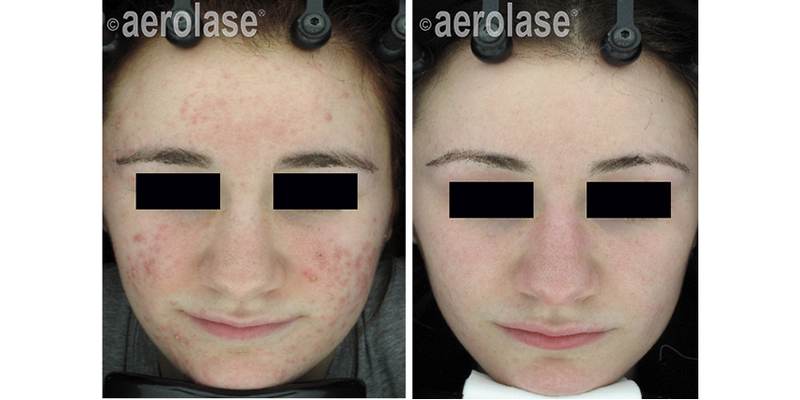 What makes Aerolase the leading acne laser treatment? Aerolase uses short pulse times and a wide light length to effectively treat acne bacteria and clear acne-related skin damage at the cellular level. Outdated traditional laser treatments use longer laser pulses. These extended pulses do two things that hurt your skin—they damage the area being treated by extending the treatment time, and they damage adjacent areas because the laser light has time to defuse through the skin. How do Aerolase’s shorter pulse durations protect your skin? 650 microsecond pulses allow the Aerolase lasers to harness greater power to effectively treat your skin without pain or damage to adjacent healthy skin cells.Traditional Nd:Yag lasers, which have a pulse length of over 5 milliseconds, use much less power than the Aerolase Neo. 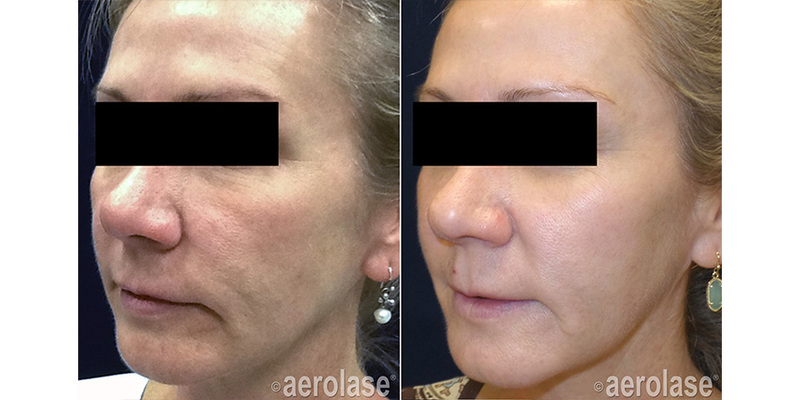 Why does Aerolase’s light wavelength heal dermal and epidermal skin layers? 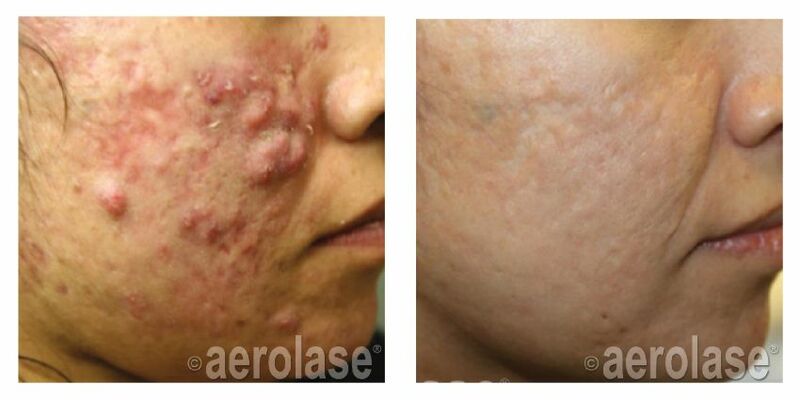 The 1064nm wavelength used by the Aerolase laser can penetrate the skin up to 8nm deep. This light wavelength is ideal for treating a wide variety of different conditions including acne, scarring, hematomas, and pigmentation. 1064nm light is absorbed into the deepest layers of the skin to provide neocollagenesis and is absorbed into the hemoglobin of your skin cells. Absorption at this level has the strongest effect on acne and actively destroys the bacteria that causes it. This treatment also stimulates collagen which reduces the appearance of acne scars. In addition, the 1064 nm light wave shrinks the sebaceous glands to reduce the overproduction of oil that causes acne. This effect will help keep your skin acne free for many months to come. After an average of 3 – 4 treatments a study of 73 subjects found that 80% of the participants rated their satisfaction as Medium or High. Don’t accept acne. It is a treatable condition, and we can treat it whether you’ve had ongoing acne for your entire life or are experiencing it for the first time. Contact us today to schedule an initial intake appointment. 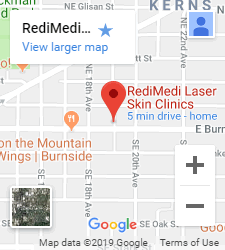 You can live an acne free life—RediMedi laser skin clinics can help.